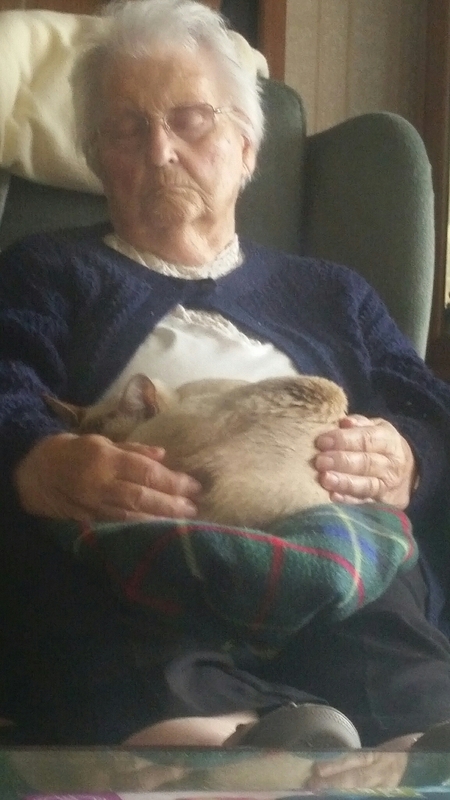 My mother was never an huge animal lover, she liked them well enough but we didn’t grow up with them and she never had her own. My sister has always had animals, mostly dogs and horses and for many years Fran and I have had cats. Indeed mum was there when our new Tonkinese kittens came home and was instantly taken by their friendliness and softness (in fur and temprament). 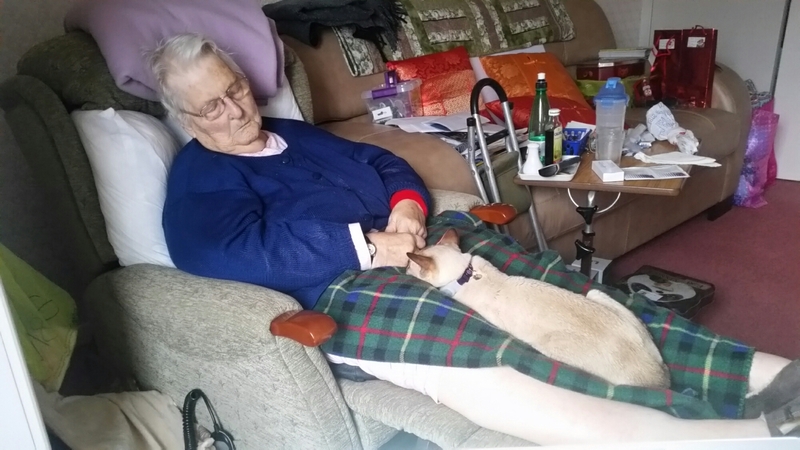 Over subsequent years mum became increasingly fond of the cats, particularly our loving boy Orlando, and she loved visiting them and buying them toys and treats. She even started carrying plastic bags to make sure that lunch left-overs made it home safe for them. 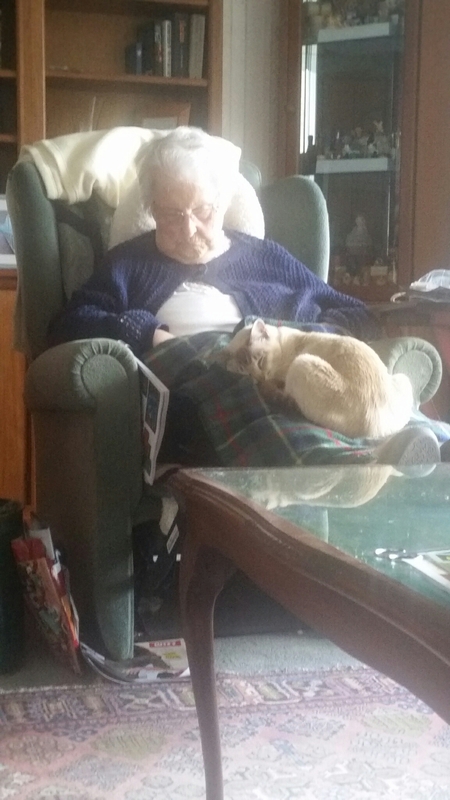 Mum lived only a 5 minute drive away and I’d visit most days, often taking Orlando with me as he loves car journies and he became more and more familiar with her flat and sitting with her. His sister Clicquot went too sometimes but was less fussed so it was mostly his adventure. As mum became more ill, and I spent more time there, Orlando became quite insistent on his daily visit … standing by our front door and shouting, pulling his cat box out and climbing in and rushing to me when I got out mum’s keys (and only mum’s keys)… at times he was almost intolerably noisy in his demands but the moment he was let into the car he shut up and apart from when he needed a wee he was quiet at mum’s flat and even stopped asking to go on her balcony. He would march in, put his paws on her shoulders and rub her face, get a treat (bacon) and then settle on her lap so they could both doze. As mum became less mobile I would often hear her talking to him and telling him things about her pain that she wouldn’t say directly to us. He was her comfort and her confidante when she needed a sympathetic ear. 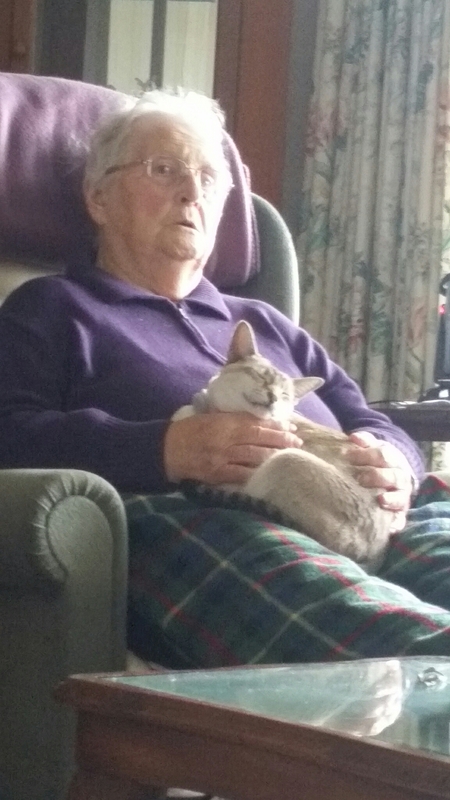 Eventually mum was admitted to an hospice. Orlando no longer got taken out and he started to spend hours by the door and walking around our house shouting and refusing to settle. So we took him to the empty flat for a look around … he kind of got it and calmed down quite a bit but still asked to go out everytime I went to the car. Two of the last intelligible words my mother said were “cat” and “tonkinese” and so with the blessing of the staff I took Orlando in for a visit. Mum was pretty far gone by then and I had to hold her hand on him so she would know he was there. Orlando had a look around then climbed on mum and pushed against her face as he always had. Once he had done that he climbed back into his box and sat quietly waiting to be taken home only reluctantly coming out to win the hearts of a few nurses. Orlando stopped standing by the door shouting. He settled again like he used to. He stopped asking to get into his basket and no longer cared if I picked up mum’s keys. Mum died a few days later. Orlando is not “mourning”, he is a cat, he just seems to know that there is no longer someone to visit and that, to him, is perfectly natural. Our sweet natured Orlando was the perfect Medi-Cat, loved by mum, us and staff alike and providing mum with comfort and friendship in ways we, perhaps, could not. 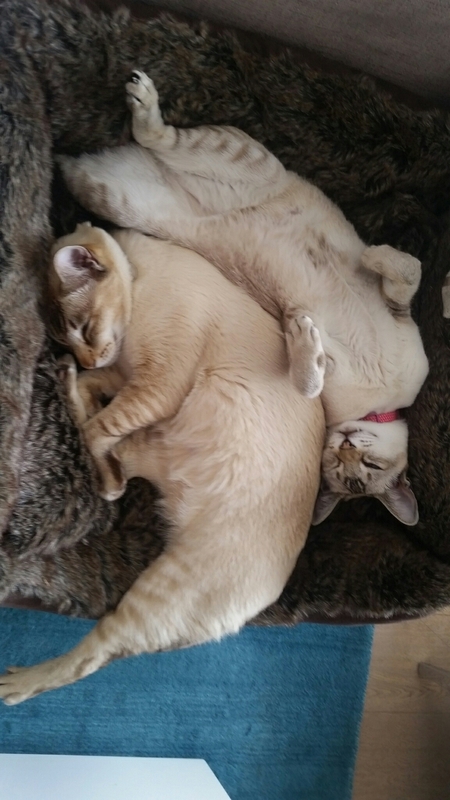 He and his beautiful sister are now there to provide us with the comfort and unquestioning love offered by cats in general and Tonkinese in particular.